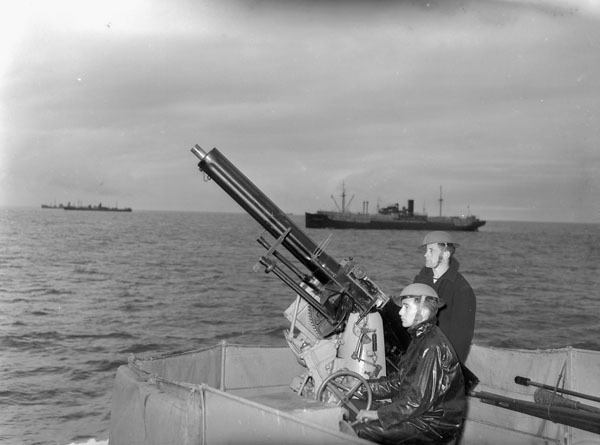 2-pdr on unidentified Canadian River Class destroyer ca. 1940. Library and Archives Canada Photograph MIKAN no. 3566993. Introduced to the Royal Navy in March of 1915 as a large-caliber AA MG. Generally similar to the later 2-pdr Mark VIII including using the same water-cooled barrel, but the automatic mechanism was lighter and less robust. As introduced, these guns used 25-round fabric belts. Used only in single mountings. Britain produced a total of 795 guns of which 577 were still available in 1939. The original Mark II design was prone to many faults and the Mark II* was a modified version which improved reliability. Stoppages and jams were still frequent in these models, as the rounds slipped out of their holders and the fabric belts often stretched and tore. The Mark II*C was a further modification which used a 14-round steel-link belt instead of the fabric belt. These steel-link belts were also used on the later 2-pdr. Mark VIII guns. Some fifty of these guns were sold to the Italian Navy. They were then manufactured under license by Terni (Italy) until the early 1930s. The Terni version used a 50 round ammunition box. 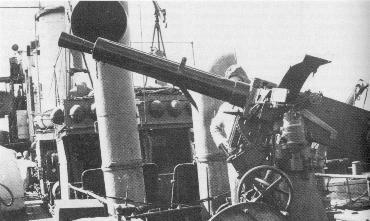 Russia ordered a number of these guns from Vickers during World War I and by 1916 forty of them were on hand in the Russian Navy (20 each in the Baltic and Black Sea fleets). In 1916 the Russian Navy ordered sixty additional guns from the Obukhov factory with at least twelve of them being delivered by 1917. All of these weapons used 25 round belts. There was also an earlier Mark I version, but I lack details as to what were the differences between it and the Mark II. Actual bore length was 39.37 calibers for all weapons. The data that follows is for the British version except where otherwise noted. ^HE projectiles were also known as "Common" and CP projectiles were later known as "SAP" projectiles. 2-pdr. No. 121 Time/Impact Fuze. 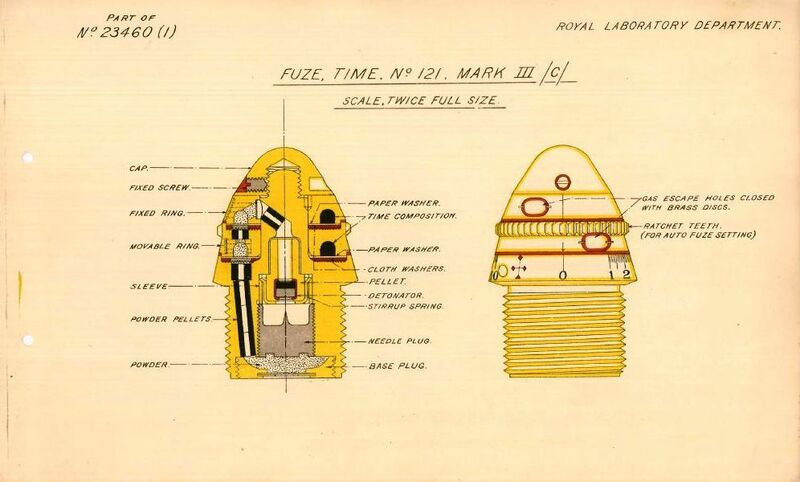 HE projectiles were originally issued during World War I with direct action (impact) fuzes such as Fuze No. 131 mentioned above that were sensitive enough to detonate when hitting an aircraft fabric covering. Some time later they were issued with dual-action fuzes that had both impact and time operation. As can be seen on the adjacent sketch of the No. 121 Fuze, these had a knurled ring on the fuze body which was used to set the fuze time. My understanding is that the gun mounting had a toothed bar which spun the ring as the ammunition belt was pulled across it by the gun. The crewman operating the fuze setter could move the bar so as to change the number of teeth that engaged the ring as it passed over the bar and thus set the time. The operational concept was that the crewman operating the fuze setter could observe the shell bursts and "walk" the bursts onto the target. In reality, as the time fuze was by chemical action and these burn at different rates depending upon air-pressure, humidity, temperature and shell orientation, the timing was not precise enough to ensure that the bursts would be close enough together to damage the target, even if they were set perfectly. Finally, the 2-pdr projectile had a very small burster and thus a low lethal radius which meant that even a close burst was unlikely to seriously damage the target. As aircraft speeds increased during the 1930s and aircraft fabric coverings gave way to metal skins, the impracticality of this approach became even more apparent. As a result, the time function was abandoned and only the impact function was used. The later 2-pdr Mark VIII guns and mountings used the same HE projectiles (now known as the "LV Type") but to the best of my knowledge they were not equipped with fuze setters. Existing LV rounds still in stock were used up during the war. New production of LV Type and later HV Type projectiles used standard impact fuzes such as the one shown at the bottom of the 2-pdr. Mark VIII datapage. The Italian shell was self-destructing at 4,900 yards (4,475 m), which implies that it had a range of at least that far. ^Early mounts had a single gunlayer who had both elevation and training handwheels. Later mounts added a trainer with a single handwheel but the gunlayer retained both of his handwheels. Most of these mountings had both the gunlayer and trainer sitting down, but some were designed such that they stood up. ^The Mark II*C modifications were for using the steel-link belts. ^Mark XV was a powered mounting similar to the Mark XVI mounting for the the 2-pdr. Mark VIII. Twenty-eight were produced during World War II and the surviving twenty-three were scrapped in early 1944. 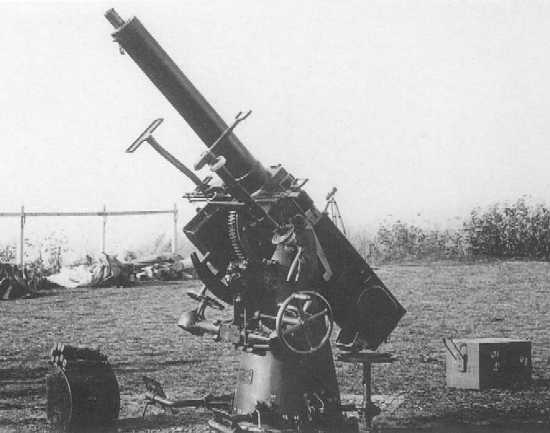 Loading a single 2-pdr Mark II*C ca. 1938 on an unidentified Australian warship. Note that this gun has been modified to use steel-linked belts. State Library of Victoria Image H98.105/3184. 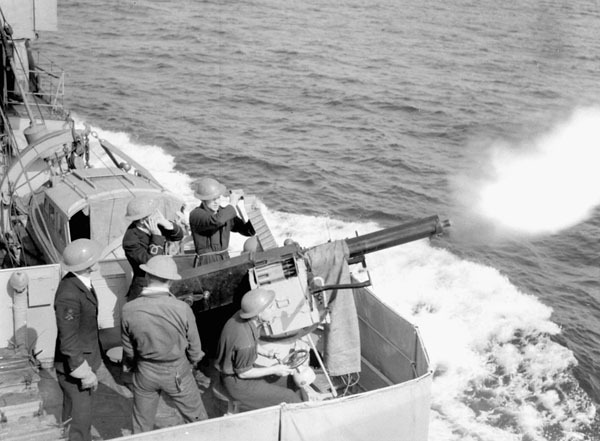 40 mm/39 Mark II* gun on HMCS Assinboine in July 1940. 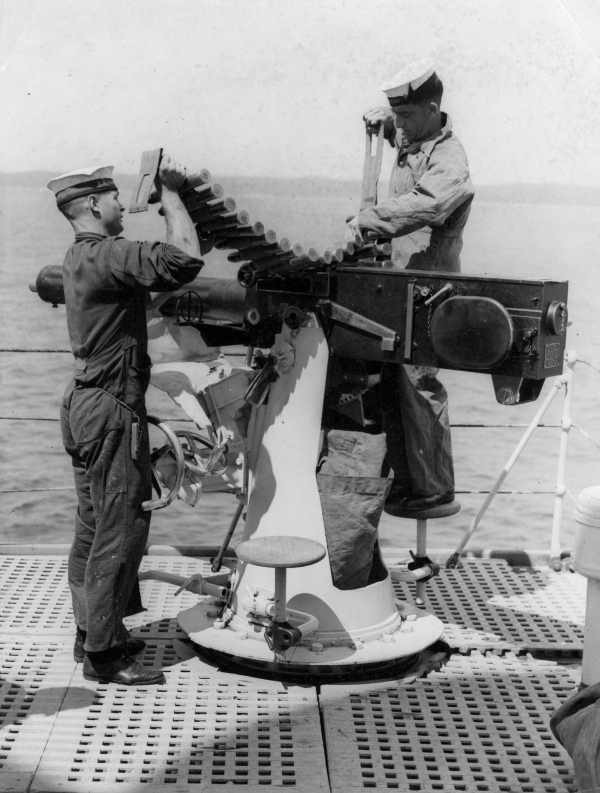 Note that this gun still used a fabric belt and that the belt exited the gun right at the gunlayer's head, hence the need for a crewmember to hold the belt up. Canada. Dept. of National Defence / Library and Archives Canada / PA-104060 photograph MIKAN no. 3566440. 40 mm/39 Vickers-Terni Model 1915 on unidentified Italian Torpedo Boat. Photograph copyrighted by Elio Andò. 40 mm/39 of 342 AA battery at Vizzola Ticino (near Milan's Malpensa Airport). Museo della Guerra di Rovereto Photograph 32/40. The Vickers Photographic Archive - See Vickers Pom Pom and photograph numbers 2836 and 2837 (This is my best guess, but these last two photographs may actually be Mark VIII or Japanese guns).